Mumbai, Aug 22 (IANS) Cricket legend Sachin Tendulkar on Tuesday appealed to people to care for their eyes and protect them from diabetes during the upcoming 10-day Ganeshotsav festival. “Not many people are aware about blindness caused by diabetes — it’s a new term ‘Eyebetes’. I urge you all to take time out and get your sugar (levels) and eyes checked when you go for Ganpati Bappa’s darshan,” Tendulkar said in a public appeal. 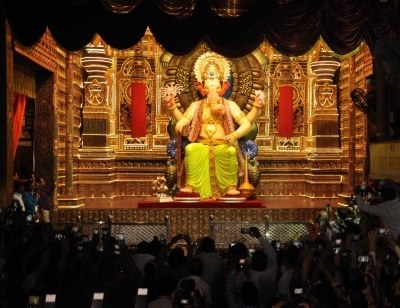 His appeal came for ophthalmologist Nishant Kumar, who, along with his team will conduct a special ‘Eyebetes’ camp at the famed Siddhi Vinayak Temple in Prabhadevi from August 25 to September 3, as part of the Ganeshotsav celebrations. “The free ‘Eyebetes’ camp will offer the devotees an opportunity to get their sugar levels checked and their eyes scanned. This campaign has already garnered a positive response from the masses and renowned celebrities,” Kumar said. Kumar, who is attached to the nearby P.D. Hinduja Hospital, and is heading the ‘Eyebetes Foundation’, said India is on the verge of becoming the Diabetes capital of the world, overtaking China. China has the highest number of diabetics in the world. But it is estimated that in the next few decades, India will have more than 100 million diabetics, and every fifth person in the country will be suffering from this lifestyle disease. “However, a vast majority of the Indian population is unaware of this most common lifestyle disease, its effect including poor eyesight and blindness, and the Eyebetes camp is intended to educate the people,” he said. “Do not take your health for granted. Your eyes are very precious, so go and get this free check up done,” Tendulkar urged. Lauding the venture, Tendulkar said Kumar and his team would assist the people with health tips on controlling diabetes since early detection can ensure a faster cure.